High-Quality Oil Change: Even if you had an oil change recently, it’s important to ensure that your car is running on the proper oil. According to the Department of Motor Vehicles (DMV), the oil in your car’s engine changes in response to the temperature at which the engine is running, which is tied to outside temperatures. During winter, thinner, less viscous oil is required. Mr. Clean Car Wash will figure out the details and determine the best oil for your car. Even better, oil changes come with a free interior and exterior wash. Our service also never includes any shop or oil disposal fees. Engine Coolant/Anti-Freeze Service: Despite its deceptive name, your car’s engine coolant doesn’t just keep your engine from overheating in the summertime. This important additive helps prevent your engine from freezing or corroding. The DMV recommends that during winter, vehicles run on a combination of 60 percent coolant and 40 percent water. Making this adjustment to your coolant is something we do for you, as well as recommend the best coolant for your auto. Car Battery Check: Avoid getting stuck in inclement weather because your car won’t start thanks to a failing battery. We check the fluid level in your car battery, which may evaporate over time, and fill when necessary. 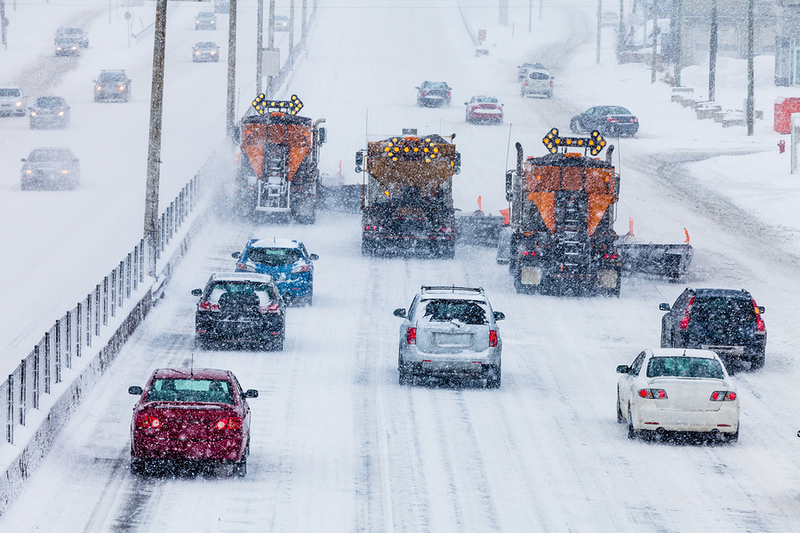 Brake Fluid Level Inspection: Brake problems with your vehicle can be extremely dangerous—especially in slippery, freezing conditions common during winter. Our winter maintenance services include checking your auto’s brake fluid levels. Check Inflation of Tires: Navigating the potentially hazardous conditions that winter can cause is easier and safer when your tire pressure is correct. Not to mention that proper tire pressure is the key to good gas mileage. Inspect and Fill Transmission and Differential Fluids: A properly working transmission is critical to your safety and the integrity of your car’s engine when you’re out and about this winter. We check transmission fluid levels, as well as differential fluids, the latter of which are responsible for transferring power from the transmission to the wheels. Steering Fluid Check and Fill: As you navigate rough weather, it makes it easier and safer when your steering wheel has the proper amount of fluid and is working well. Check Windshield Fluid and Wiper Blades: Keeping your windshield as clear as possible during wet and snowy weather is imperative to a safe winter driving experience. We check windshield wiper fluids and top them off when necessary. We also inspect your wiper blades to see that they are working efficiently and safely. Visit Mr. Clean Car Wash today for your winter maintenance checkup. Every one of our oil and lube services includes an important 15 Point Inspection Oil Change and a FREE Full Service Carwash!